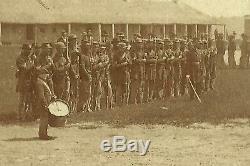 A great CDV showing the SOLDIERS AT ATTENTION with the OFFICERS to the right---a DRUMMER is to the left. 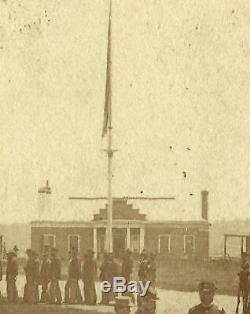 The COMMANDANT'S QUARTERS is in the background with the FLAG POLE in front. Interesting side note---when I was working at Fort Snelling in the late 1980s I was on a archeological dig looking for the ORIGINAL FLAG POLE from the 1820s on the opposite side of the fort. This photo has a backmark from J. CARBUTT PHOTOGRAPH ARTIST----I believe out of Chicago. 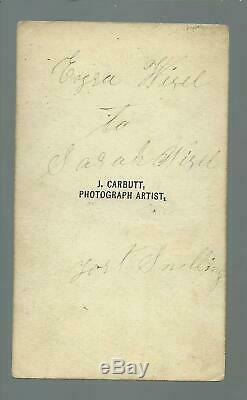 It is SIGNED ON THE BACK from the SOLDIER to his WIFE: EZRA WISEL TO SARAH WISEL FORT SNELLING in period ink. I do not know if Ezra is in the photo or not---possibly. Online searches found the following---including his GRAVE at a small family cemetery in Fillmore County. The regiment participated in the battle at Wood Lake, September 22, 1862, and garrisoned frontier posts from November, 1862, until May, 1863, when ordered upon Indian expedition; engaged with the Indians, July 24, 26 and 28, 1863. Stationed at frontier posts from September 18, 1863, to June 5, 1864, when ordered to Helena, Ark. 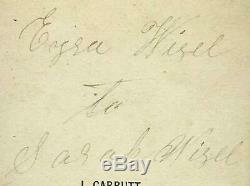 November, 1864; to New Orleans, January, 1865. Assigned to the Sixteenth Army Corps. 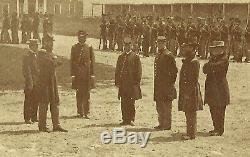 Participated in engagements of Spanish Fort and Fort Blakely, April, 1865. Discharged at Fort Snelling, August 19, 1865. Braden; first lieutenant, Henry S. Bassett; privates, William Andrew, Peter Anderson, David Atkins, Luther Barrows, John Bottom, John H. Cooper, George Conklin, Robert Crowell, Alexander Dauchy, Robert Douglas, William Drury, George Drury, Alfred Drury, John Fair, Robert Fairbanks, Daniel P.
Gould, Ormel Gould, Alfred Haskins, Fabin Hastenson, Homer Halverson, Carl Hegenstein, Norman Hantwell, Daniel Hanson, Griffin Holmes, John Laughtenheiser, Andrew Lillie, Alonzo Landon, William Logan, Lionel C. Long, Abraham Lang, Michael McDonnell, James McDonnell, David McKisson, Cyrus N.
Miller, Edwin Morey, James Neal, Henry Pennock, William Pulford, John S. Ransdell, Samuel Riddle, Frederick W.
Co K 6th MN InfAge: 21 Induction Date: 15 Aug 1862 Birth Place: Indiana Residence: Preble, Fillmore Co. MN DIED 18/NOV/1864 AT PRAIRIE DU CHIEN, WISCRef: MN Civil War Soldiers, MN Adjutant General Report 1868 Wisel Cemetery Fillmore County Minnesota... There is a small American flag and a veteran's marker for Ezra who died earlier as a soldier in the Civil War. It measures 4" by 2 1/2". THIS IS A VERY RARE IMAGE AND A CENTERPIECE OF MY COLLECTION!! It is in VERY GOOD CONDITION with light wear, smudging--------SEE THE SCANS. The item "Minnesota CDV 1862 CIVIL WAR Interior FORT SNELLING Soldiers AUTOGRAPHED Roll" is in sale since Wednesday, March 13, 2019. This item is in the category "Collectibles\Photographic Images\Vintage & Antique (Pre-1940)\CDVs". The seller is "chippewacity" and is located in Decorah, Iowa.